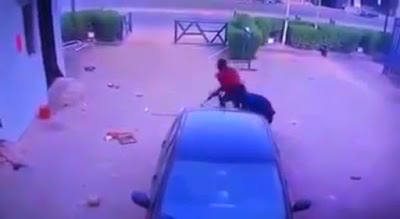 The police have trailed and arrested two of the Offa robbery suspects who took part in the deadly attack on five banks and a police station on 5 April, killing as many as 17 people. The notorious criminals were nabbed in Lagos. Mr. Jimoh Moshood, the Police Police PRO identified the two suspects as 39 year-old Alexander Reuben and 28 year-old Jimoh Isa. They were all arrested on 11 April. They were among the 12 suspects so far arrested by the police. Another suspect Adetoyese Muftau, 23 was picked up in Ibadan, while three other suspects were arrested in Ilorin, capital of Kwara state. The three were identified as 18 year-old Aminu Ibrahim, 23 year-old Richard Buba Terry and 25 year-old Peter Jafar Kuunfa. Jimoh also said in the update released today that six suspects were arrested in Offa, where the dastardly crime was staged. Two out of the suspects nabbed in Offa were caught with the SIM cards and phones of some of the victims of the robbery violence. They were identified as Azeez Salawudeen, who is aged 20 and Adewale Popoola, who is 22 years old. In all the police have collected from the suspects, two Beretta pistols, 20 bullets, four Phones and SIM cards belonging to victims, some of whom were killed during the attack.